Irrigation Tubing - Ace Steel & Recycling Inc.
Irrigation pipes lead tough lives, and often end up battered, bruised, and abandoned at the edge of a field. Ace Steel can provide hope and a sense of direction for wayward or abandoned irrigation pipe - that's right, we recycle it! Bring us your pipes - steel or aluminum - and you'll drive away with some coin in your pocket. Questions? Give us a holler at 342-8649. We're open weekdays 8- 5, and Saturdays 8 till noon. 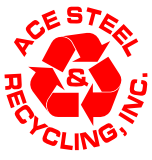 Ace Steel & Recycling, doing our best to keep western South Dakota clean, green, and pristine!